Bacon is fatty. It’s the nature of the beast—literally—because bacon is made from pork belly, which is a naturally fatty section of a hog’s carcass. That’s part of why bacon tastes so good: Fat is flavor. But we’ve also been taught that fat is unhealthy and unappealing. And this tension may explain why bacon has one of the most unusual and underappreciated packaging formats of any supermarket product. You’ve probably seen and handled supermarket bacon countless times. 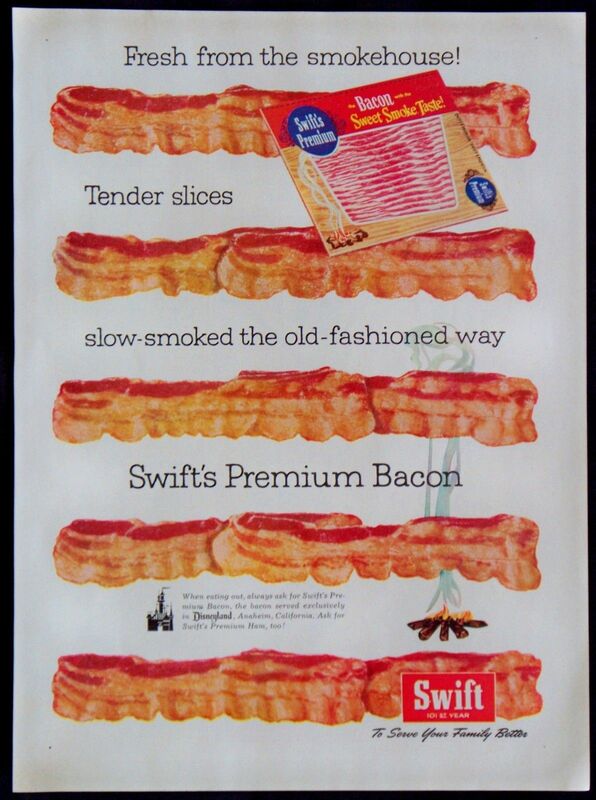 The standard one-pound package shows the bacon slices fanned out, with only their leading edges exposed. The industry term for this is a shingle pack—a reference to the way the slices overlap. 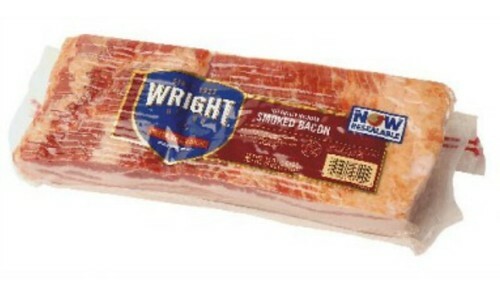 Because those front edges tend to feature more lean muscle than the fattier back edges, and because the face of the top slice is invariably covered by a paperboard flap containing the manufacturer’s logo and other branding information, the consumer sees a relatively unbroken field of red protein, creating the illusion that the bacon is leaner than it is. 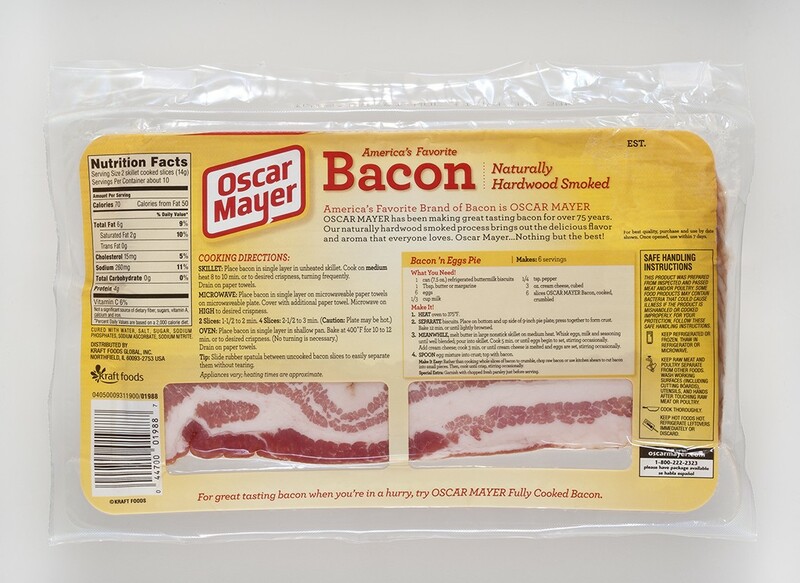 That illusion is stripped away on the back of the package, which has a window providing a view of the bottom slice, allowing the consumer to see how the bacon truly looks in all its fatty glory. Taken together, these front and back views provide an unusual duality. Lots of package designs promise more than the product can deliver (think “Serving Suggestion”), but the shingle pack doesn’t just present an idealized bacon fantasy—it also provides a built-in reality check. It’s hard to think of another package that engages in such a clever sleight of hand on the front and then gives away the game on the back. It would be nice if the shingle pack’s front/back dichotomy were the bacon industry’s way of mirroring our larger societal ambivalence regarding delicious yet fatty foods. But the reality is far less prosaic: It’s due to a federal regulation. The U.S. Department of Agriculture, which regulates bacon and other meat products, spells it out like so: “Packages for sliced bacon that have a transparent opening shall be designed to expose, for viewing, the cut surface of a representative slice. ... For shingle-packed sliced bacon, the transparent window shall be designed to reveal at least 70 percent of the length (longest dimension) of the representative slice, and this window shall be at least 1-1/2 inches wide." That regulation went into effect in 1973. While intended as a truth-in-packaging measure, it has the inadvertent effect of giving the shingle pack its odd split personality. The shingle pack already existed well before the rear window was added, but historical documentation is spotty. Dan Miller, who’s worked in research and package development at Hormel Foods for 25 years, gave a typical response: “No idea. You’re talking about things that go way back.” Moreover, the package appears to be a touchy subject within the industry. Oscar Mayer, the leading bacon brand, declined to comment for this article; another leading brand, Smithfield, failed to respond to repeated inquiries; and a retired industry veteran would speak only anonymously. Who knew bacon packaging could be so fraught? That is apparently what led the USDA to mandate the rear window, as a way of providing transparency, literally and figuratively. By 1974—a year after the rule went into effect—Oscar Mayer had patented a package “wherein the bacon slices are arranged in shingled relation on a backing board which is apertured so as to render visible at least the major portion of the bottom face of a full bacon slice when the slices are placed thereon.” Unfortunately, the Oscar Mayer employees listed as the inventors are now deceased. No source contacted for this article was aware of any studies indicating whether consumers actually turn the package over and examine the rear window, which raises the question: Has the shingle pack outlived its usefulness? One promising alternative is the stack pack, which shows the slices arranged in a slab, with the front and back ends plainly visible (and no L-board, so it’s more environmentally friendly). There’s no shingling, no rear window, no embellishment, no ambivalence—it just lets bacon be bacon. “We’ve had the [rear window] regulation now for 40-some years,” said Andy Milkowski, who worked in research and development at Oscar Mayer for three decades and currently teaches in the Department of Animal Sciences at the University of Wisconsin-Madison. “It’s one of those automatic things you don’t even think about. But people understand what bacon is. They understand that when they fry it up, it’s going to have a lot of fat.” Exactly. Maybe it’s time for a package that embraces that reality.